This entry was posted in Disability and tagged benefits, Disability, disability application, disability benefits, disability interview, disability starter kit, doctor, household expenses, income, living arrangement, low income, marriage, martial information, medical issue, medications, Social Security benefits, social security disability benefits, Social Security income, Social Security taxes, ssi, supplemental security income by Jim Borland, Acting Deputy Commissioner for Communications. Bookmark the permalink. Thank you for the latest update on my benefits, peace and love, Doug. There were NO updates on your benefits or anyone else’s for that matter. Im a widow my husbad died of lung cancer eleven month’s after we married i have been shot in both legs took me 4 years befor i could walk again i can’t stand very long and can’t. Stay setting. In one spot i also have proublems mentally. After my son was murder. Can i receive ssi? Maybe, why don’t you apply?? The only way you will know is to apply. For SSI, you have to have little to no income and no more than $2,000 in resources if you are single. Are you seeing a doctor and/or psychiatrist or psychologist regularly for treatment of your impairments ? SSA will get copies of your medical records. If you don’t have current medical records, SSA will send you to one of their doctors. It is never a good idea to depend on the report from a SSA doctor for approval. SSI is for those that are disabled and have little to no income and resources. They also do not have enough work credits. SSDI is for those that have worked and earned enough work credits. Depending on your age and if your husband was insured at the time of his death, if you are approved you may be eligible to receive benefits off of his work record. To apply for SSI you can download a application, call SSA and ask them to mail you an application, call SSA and ask them if you can file your SSI application over the phone or you can go into your local SSA office. To apply for SSDI, you can go online. Go to the link below for more information. My son is 25 yrs. Old now when he was younger at the age of 7 he was diagnosed with bipolar disorder and we took many hours of counseling and therapy he was doing well not perfect but well enough to be intelligent at what he put his mind to. When he turn 18yrs. SSI and public aid took his medical card and stop getting treatment He’s very impulsive and has trouble focussing on basicly common sense. His job history is irregular, he just got fired again. He self medicated and has overdosed twice and I’m at my wits end is it possible to register for SSI again cause he needs to go back on his meds and got to couseling I am worried for him. He’s bipolar just like his mom and I’m constantly worried about him. Hi Angela. We pay disability benefits through two programs: the Social Security disability insurance program (SSDI) and the Supplemental Security Income (SSI). The SSI program is a needs-based program that pays benefits to disabled adults and children who have limited income and resources. SSDI benefits, on the other hand, are based on earnings and are not subject to income and resource limits. We pay disability benefits to people who are unable to work because of a medical condition that is expected to last one year or more or to end in death. 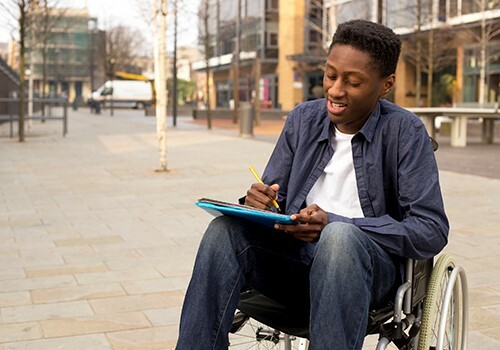 However, if a person thinks that he or she meets our definition of disability, we encourage them to apply for disability benefits when they become disabled. Your son should call our toll free number at 1-800-772-1213 for further assistance. If he does not qualify for SSDI benefits, our agents can schedule an appointment for him to apply for SSI benefits at the local Social Security office. Representatives at our 1-800 number are available Monday through Friday, between 7 a.m. and 7 p.m. For more information, visit our “Frequently Asked Questions” web page on disability. We hope this helps. Thank you for your question Eugenia. If you are the widow of a person who worked long enough under Social Security, you may be eligible to receive reduced widow’s benefits at age 60 (age 50 if disabled). As for disability benefits, we pay disability benefits through two programs: Social Security Disability Insurance (SSDI) and Supplemental Security Income (SSI). The Social Security Act sets out a strict definition of disability. Our agency pays benefits to eligible individuals who can’t work due to a disabling mental or physical condition that is expected to last at least one year or result in death. If a person thinks that he or she meets our definition of disability, we encourage them to apply for disability benefits as soon as possible. For more information visit our “Frequently Asked Questions” web page on disability. For further assistance, you should call our toll free number at 1-800-772-1213 from 7 a.m. to 7 p.m. Monday through Friday. Or contact your local Social Security office directly. We hope this information helps. You may have more options than you think. Depending on your age, survivor benefits from losing your husband. You probably qualify for either SSI or SSDI depending on your work history. Your disability limits your ability to work today. So many people think of Social Security as only a retirement program for older Americans. It is great that you are reminding them about the disability protection provided by the system. People should also be reminded about survivors”benefits that are available. Social Security is a very complete social insurance program. Thank you for your comment Mel. Many services are conveniently available anytime at our website. Individuals can create a personal my Social Security account to get general information about our programs or manage their Social Security benefits. Also, we respond to questions and provide general information on our Retirement, Survivors, Disability, Medicare and SSI programs through our Blog and Facebook page. If you have a general question, we encourage you to ask here. But remember, never post personal information on social media. NO, I repeat NO updates were given, just good info on what you need to file and it’s been that way for over 40 years. We appreciate your thoughts Wendolyn. Thanks for your comment! My brother is 93 I took him to S.S. office he gave were he wanted check to go and it went in 2/3/17, my brother also gets a pension from Navy that someone changed and got that which i am working on. I thought i check with S.S so i took him there and they said someone changed it on the Internet. My brother is in a rehab for his feet so i have to travel over 100 miles to get him and take to S.S office so i took him Feb 21st 2017 waited over an hour they called his number i start saying who called A 3 because he was in wheel chair and we were up front and couldn’t see anyone from there so when the people seated there said what window i had to push him there and when i just got there she called A 4 A 5 A 6 I said i didn’t hear her from up front and she said get another ticket which i would have but my brother had to get back to rehab to eat and get meds, I told the person they were very cruel and just left. The people sitting there also wanted me to take there spot but the girl said can’t has your S.S number that drive was 120 miles. Call them and ask for a field representative to come out or call their toll free # and do an address change. We are sorry to hear about the inconveniences you and your brother experienced and regret that you did not receive the level of customer service you deserve. Since it sounds like your brother may need help when managing his Social Security benefits, you may be interested in applying to become your brother’s representative payee. If approved to serve as your brother’s representative payee, it will make it easier for you in the future to update account information for him. It would be helpful to obtain a statement from his doctor. The statement should say that he is not able to take care of himself and that you are the person that helps him keep his finances in order. We understand how inconvenient this may be for you, but hope you understand our role in protecting everyone’s personal information. Please read our publication: A Guide For Representative Payees. If you have specific questions, or to make an appointment, please call 1-800-772-1213 between 7 a.m. and 7 p.m. to speak to one of our representatives. We thank you for bringing this to our attention, while we hope your next experience in our offices is totally different, we remind you that you can always request to speak with the office manager to present a complaint or to see how we can help resolve the situation. I currently receive SSI temporary Please do not cancel my benefits. Emily Dawn Simmons,, did you receive a letter saying SSA was going to stop your SSI ? If you did what was the reason? Did you receive a Short or Long form to fill out so SSA can determine if you continue to meet their criteria for SSI ? If you did, you need to fill out the form and return it ASAP. Posting a note here asking SSA to not stop your SSI does no good. Donna, if you have Medicare and are low income you may qualify for Medicare Savings Program. Information for that program is at the link below. Hi Donna. You may be eligible to receive assistance from the state where you live. These services include Medicaid, free meals, housekeeping help, transportation or help with other problems. You can get information about services in your area from your state or local social services office. You can also visit the U. S. Department of Health and Human Services (HHS) web page for more information. For information about our disability programs, visit our “Frequently Asked Questions” web page on disability. We hope this information helps. I have Appealed my SIS and SAD three times and this is my fourth Appeal I have been waiting for my Appeal Hearing since 2015, how much longer do I have to wait to get approved for benefits? I have Rheumatoid Arthritis in my hands, Neuropathy in my feet, Fibromyalgia and Depression, Anxiety, as well as Insomnia will I be rewarded this time? Thanks fir your Support and Advice on this issue in hand. I meant to say SSI and SSD. It is difficult to determine if you will be approved at the appeal level. Sinetime it takes up to two years or longer to receive a decision. The disability process is complex. It your medical impairment does not meet or equal the listing. There is a sequence of evaluations used to determine if your condition after being assessed with a residual function capacity. That assessment is done based on your medical information and your functioning capacity. Then they look at your age, education, past work history to determine if a medical vocational allowance is met. It is a complex process but a fair assessment process. I hope this will help you to understand it better. Each person’s assessment is different. Do you have a lawyer? If so ask him to get the status. No on on this blog site could possibly answer your question, good luck! No lawyer?, get one on a contingency basis. No one can say if you will be approved or not. The wait period for a hearing varies depending on where you live. How busy your attorney is also plays a part. Your attorney has to be free when ODAR can schedule a hearing. If they aren’t, your hearing will be at a later date. Call in to the SSA 1800 number at 1-800-772-1213 for someone to check on the status of your claim. They can’t access your personal information through this blog. I have psoriatic arthritis throughout my whole body, depression and anxiety and I am still working full time. You must be to the point that you CAN NOT work any longer, not to the point that you DO NOT want to work any longer to be approved. That is why I didn’t even think of applying. As I said, you should call in to find out the status of your claim and what the next step is. No one will be able to respond to you with exact information from your record, through this blog. helen, so you have NOT had your admin law judge hearing, right? it has taken 2.5 yrs. for many of us from when we filed to see a JUDGE!! sitting ,standing, lifting, climbing, crawling, bending, using our hands, and a couple more. and your medical reports DOCUMENT these. you need a RFC, residual function capacity form, they changed names but those names are in the new name, so google it. your dr. makes this out for how you are TODAY; NOT your last day physically at work. bettyg, iowa took 5 yrs. of hell to be approved on 2nd try since my lawyer who quit me 4 yrs. into this DIDN’T submit a brief to appeals counsel since DDS never sent a copy of the taped admin law judge hearing to him!!! grrr. i requested the copy of the tape also since i was then representing myself; they never sent NOR acknowledged my request. Hi Helen. The length of time it takes to get a hearing can vary from state to state. We attempt to resolve all claims promptly, but there may be delays due to the volume of pending appeals in your area. Please continue working with your local hearing office on specific questions about your case. Thanks. When will I be review for my benefits ? How will I be contacted and will this determine my status for permitted disablity??? My health has turn for the worse!!! Continuing DIsability Reviews (CDR) are based on Medical Improvement Expected. They are usually at 3 years or 5-7 years. But, they can be more often. You will be mailed a Short or Long Form. If a long form is done, SSA will get copies of your medical records. SSA will also send you forms to fill out like the ones you filled out when you first applied. Everyone receives Continuing DIsability Reviews. Hi Claude. We understand that a medical review can be stressful. We conduct medical reviews from time to time to make sure you are still disabled, and we only evaluate factors that permanently affect your ability to work. Also, we obtain and consider medical evidence from your doctor or other medical sources, if needed. The review depends on how severe your medical condition is and the likelihood it will improve. Generally, if medical improvement is possible, we will do a continuing disability review (CDR) approximately every 3 years. If not, we may review it less frequently. You will be notified by mail, when and if we need to review your case. You will be given enough time to respond and contact us for further instructions. For other factors that we consider in reviewing your disability status, please read our publication, “What You Need to Know: Reviewing Your Disability”. We hope this helps. I have been under review for a whole year with no answers. This is blowing my severe panic disorder out of the water. Also, it took them 20 yrs to do a review. Why? I have heard the 3-7 yrs but it was never done. The Social Security Administration conducts Continuing Disability Reviews from time to time to make sure the individuals receiving checks are still eligible to get them. Generally, if medical improvement is possible, we will do a continuing disability review (CDR) approximately every 3 years. If not, we may review it less frequently. For security reasons, we do not have access to personal records in this forum. Please continue working with your local office or call our toll free number at 1-800-772-1213 for further assistance. Representatives are available Monday through Friday between 7 a.m. and 7 p.m. I worked for almost 30 years throughout Federal Government Agencies including the office of Secretary William E. Bennett at the U.S. Department of Education in Washington, DC., After my having suffered a major stroke in 1994 I could no longer work. At that Time I had not enough working quarters in order to qualify for social security benefits. My husband and my three children for many years have been really good with helping me the best they can, which has been really hard for them. My retirement check which I receive every month is less than $500.00 a month. Since 1994 I’ve tried with getting social security help but to no avail. Please allow me to hear from you soon. “Many thanks!” Hattie H. Small. Hi Hattie. You must earn a certain number of credits to qualify for Social Security benefits. The number of credits you need depends on your age when you apply and the type of benefit application. No one needs more than 40 credits for any Social Security benefit. Some Federal employees and employees of State or local government agencies may be eligible for pensions that are based on earnings not covered by Social Security. My son’s father passed away this week. My son is 26 and has been disabled since birth. He is enrolled in the CLASS program and has Medicaid. He has never worked. His father paid child support up until his death, so my son has never been enrolled for benefits. Does my son apply for benefits as a survivor? Can I enroll him online? The disabling impairment must have started before age 22, and; He must meet the definition of disability for adults. At this time you cannot apply for disabled adult child’s benefits online. If you wish to file for benefits, contact your local Social Security office directly. Please call our toll free number at 1-800-772-1213 to request an appointment. Representatives are available Monday through Friday between 7 a.m. and 7 p.m.
I’ve met all of your conditions for Disability, but I was still denied and now in Review. I can’t sit for long periods and I can’t walk because after 2 back surgies, my surgeon paralyzed me! I could walk and drive and use the restroom, now I cannot, yet SSDI says I am able to gain employment! How? I have a Attorney, but I only talked to him twice. Once when I hired him and 2nd when I told the secretary I was going to kill myself and my life is worthless now stuck in a bed. How can we trust and depend on services when they don’t follow their own rules? Once the interview is complete how long will it take to find out if your eligible for a child ssi? Same day or weeks? My daughter was just diagnoised she is blind and has lost vision in one eye. Not one doctor caught this in all the years and she was a premie as well. Birth defect no excuse it could have been prevented. Thank you for your question Deborah. To make a determination, your child’s disability claim must be sent to the Disability Determination Services office in your state, which will make a decision based on the medical evidence. The length of time it takes to receive a decision on a disability claim, can vary depending on several factors; primarily, the nature of the disability, how quickly we obtain medical evidence from doctors or other medical sources, and if the claim is randomly selected for a quality assurance review of the decision. We use the same five-step process to make a decision on each application. We hope this helps. Thank you for replying . You answered my question. To make that determination, your child’s disability claim must be sent to the Disability Determination Services office in your state which will make a decision based on the medical evidence. The length of time it takes to receive a decision on a disability claim can vary depending on several factors; primarily, the nature of the disability, how quickly we obtain medical evidence from doctors or other medical sources, and if the claim is randomly selected for a quality assurance review of the decision. We use the same five-step process to make a decision on each application. We hope this helps. I have been fighting for mine for 3 years, and denied 3 times, I will not give up, I have bi-lateral Osteoarthritis, which makes it difficult to walk and due to my hips turning in does not help. Firbromyalgia, Raynaud’s, Essential tremors, 30% hearing loss, spinal stenosis. I’m at a loss here. The majority of what I hear about regarding actually getting disability is disheartening. There are so many rules, restrictions, mandates, etc. In some cases the applicant is deceased by the time the government gets around to making a decision. Generally, the majority of people who apply are denied the first time, regardless of their conditions. We pay into a system, not of our choice, that we cannot access when we truly need it. The frustration and humiliation a disabled individual has to go through in order to obtain disability is un-American. Still, don’t give up. Although it appears that that is what the government is hoping the majority of applicant’s will do. Jump through the hoops, be relentless in following what appears to be a never ending red tape road, and eventually, hopefully while you are still alive, not homeless, and still in your right mind, success can be achieved. Maybe one day someone in a position of power will advocate for the much needed changes in our disability program. Americans are well aware, this is just one of many programs in need of change. Hey, Ray, it could start with you. Hi Joe. Social Security disability benefits automatically change to retirement benefits when disability beneficiaries attain their full retirement age (Currently 66). Benefits are not interrupted with this transition and the benefit amount will generally remains the same. For security reasons, we do not have access to your personal records via this blog and are unable to answer your question at this time. We encourage you to contact your local Social Security office or call our toll free number at 1-800-772-1213, Monday through Friday, between 7 a.m. and 7 p.m. for further assistance and a thorough explanation. Thanks! I am 59 years old and currently collecting disability, however considering a trial basis to work. My question is this, if I am able to continue work until full retirement age, will my retirement rate be higher than my current disability rate? Hello TJ. Great question! Generally, if you continue to work while receiving disability benefits, your monthly benefit amount may increase. Each year, we review the records for all working Social Security recipients to see if additional earnings from working may increase monthly benefits. In addition, when someone is receiving Social Security disability benefits, there are special rules to consider that could help with working and not jeopardizing your disability benefits. Go to Can I return to work while getting Social Security disability benefits? for more details. Can you ever lose previously earned credits? If you decide to quit working for an extended time then later rejoin the workforce, are those previous credits lost where you have to start rebuilding credits toward 40 credits for disability or retirement? Thanks for your question, RJ! We base Social Security credits on the amount of your earnings. We use your earnings and work history to determine your eligibility for Social Security benefits. The credits you earn remain on your Social Security record even if you stop working and have no earnings for a while. You cannot lose your earned credits. See our Benefit Planner: Social Security Credits for more information. Thanks! I think your question that Jenna Yeager, Public Affairs Specialist expertly side stepped was in reference to the work credits that magically don’t count should you not work for 10 years and 1 day before you file for your disability coverage OR even better reapply because of denial left un appealed, then they counted now they don’t (40 credits, gone), you can ONLY earn a MAX. of 4 work credits yearly, NOT BASED on earnings as erroneously reported by the “specialist”. Hi Tracy. You can get your personal Social Security Statement online by using your my Social Security account. Your online Statement gives you secure and convenient access to your earnings records. It also shows estimates for retirement, disability and survivors benefits you and your family may be eligible for. Thanks! I like how you said it to provide the dates you last worked in your disability interview. I haven’t worked since the day of my accident. Thank you for the tips on private disability insurance. I am thinking of applying for disability for myself. I was in an accident and had to go to hospital . With the tests they took I found out I had serious desease I never knew. Hi Mary. We pay disability benefits through two programs: the Social Security Disability Insurance program (SSDI) and the Supplemental Security Income (SSI) program. To qualify for SSDI benefits, you must have worked long enough and recently enough in jobs covered by Social Security (usually within the last 10 years). The (SSI) program is a needs based program that gives cash assistance to disabled individuals with limited income and resources. We pay disability benefits to people who are unable to work because of a medical condition that is expected to last one year or more or to end in death. If you think you may be eligible to receive disability benefits and would like to apply, you can use our online application.
. Good INFO! . When is a good time to get an attorney? Especially when a man, age 59, educated, has not worked for 20 years d/t his physical/mental challenges, has been turned down several times before. He has a definitive and incurable physical illness which requires meds w/ side effects, developed at the least severe depression and possible Bi-Polar Type 2 (is mostly depressed, apathetic and never violent or paranoid). He has not had the ability to work because of the physical calamities happening to interrupt the process of even getting applications done and has affected communication skills. He has but 1 devoted friend to help him and friend has big financial/health limits but is committed to getting it done this time-it seems like the last chance before he is dead or a street person. He doesn’t have the skills to do that. The main disease is a rare genetic bone disease that is also progressive but not necessarily terminal. He is in a highly underserved location and a conservative state. There are no assets other than he’s a good guy and his friend was a good nurse, Can one get an attorney at the current attempt to apply but after you have been turned down before? By the way what are his chances -how long might he wait? He has fairly good documentation. Thanks, friend. Thanks for your question. Many people handle their own applications and appeals. A representative familiar with Social Security’s programs can provide a valuable service. However, the decision whether or not to seek the services of a representative (attorney or other qualified person) is up to the applicant. More information about representatives can be found in our publication, “Your Right to Representation”. The length of time it takes to receive a decision on a disability claim can vary depending on several factors; primarily, the nature of the disability, how quickly we obtain medical evidence from doctors or other medical sources, and if the claim is randomly selected for a quality assurance review of the decision. We use the same five-step process to make a decision on each application. Some individuals may be eligible to receive additional assistance from the state where they live; while they wait for a final determination on their disability claim. These services include Medicaid, free meals, housekeeping help, transportation or help with other problems. I need a letter showing when I started getting disability. Could you please either email it to me our mail it to me. Hi, Denise. For general information about your reporting responsibilities while receiving SSI, visit our Frequently Asked Questions. For your security, we do not have access to information about your account in this venue. We ask that members in our Blog community to work with our offices with specific questions. You can call us at 1-800-772-1213, Monday through Friday, between 7:00 a.m. and 7:00 p.m., for assistance. You can also contact your local Social Security office. We hope this helps.